All film criticism is extremely subjective and there is no such thing as the definitive list of the 100 Greatest (English-language) Films. Great Films can't be measured scientifically because greatness is extremely subjective. The artistic greatness of films (and other works of art) can never be rated or quantified, although critics, reviewers, and fans persistently make ten best lists, hundred best lists, all-time greatest lists, awards lists, and generate results of polls. There is no accepted standard for rating cinematic works - there are 4-star and 5-star scales, 1-10 and percentage ratings, letter grades, fresh/rotten tomatoes meters, and thumbs up/down judgments, to name a few. These only confuse the issue. This site steadfastly refuses to rank films, since it is completely frivolous to say one great film is a notch higher than another one. Over a long period of time, the English-language films found here have repeatedly appeared on all-time best film lists and are often noted in the collective responses of film viewers and critics. See this site's Summary of the Top Films of All-Time - an attempt to compile various rankings of films together in one place and provide comparisons of film rankings over time. Arguably, there has been reasonable consensus by most film historians, critics, movie-lovers, and reviewers that the selections chosen by this site are among cinema's most critically-acclaimed, significant "must-see" films (of predominantly Hollywood-American production). They are the films almost every educated person with a solid knowledge of film history and cinema would be expected to know and be literate about. See also this site's Tips on Viewing Films Critically. These crucial film selections provide a common ground and foundation for the study of film. They have undoubtedly left an indelible mark upon our lives and reflect many defining moments of the last 100 years. They are films that give us pieces of time that we can never forget. They have refused to fade from memory even after the long passage of time - they share the unifying fact of being seen and talked about decades after they were made. Many of these Greatest Films were made decades ago, and overlooked when they were first released, yet they have endured the test of time. They have the power to entertain, enchant, inform, and move us emotionally - and change our perceptions of things. There is nothing more dissimilar than a selection of great films - just naturally, there will be comedies, dramas, westerns, animations, silent films, etc., that are impossible to rank or quantify against each other in a collection of masterpieces. The films below range from the earliest defining silent films of Hollywood, to all the genre types (screwball comedies, westerns, etc. ), and to the blockbusters and epics of today. 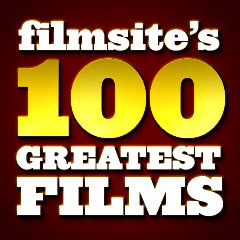 Comparative analysis and criticism provide the rationale for having many Other Greatest Film Lists posted, including other listings such as AFI's 100 Greatest American Films.